The laws of the Jewish Sabbath are as intricate and complex as any legal code ever written. The Torah, the Five Books of Moses, contains a list of 39 restrictions which Jews are commanded to avoid on the Jewish Sabbath. Each of these restrictions has endless explanations and commentaries in order to make the laws applicable and meaningful to contemporary Jewish life. The restrictions range from prohibitions on sewing, weaving, sowing, and squeezing to lighting fires - each prohibition contains myriad permutations and commentaries which cover all activities. For instance, one wouldn't wash dishes with a sponge on Shabbat because it would include squeezing", a prohibited activity. Similarly, one wouldn't braid hair because it would be considered weaving, another activity which is not permitted on Shabbat. To most people, these laws seem trite and insignificant, but to a religious Jew, they are the code that shapes a Jew's life. When the subject moves to the preparation and serving of food on Shabbat, the laws become even more complex, yet within the confines of one's home, where one can manage all the details of the Shabbat meals oneself, and an educated Jew can easily organize matters to insure that Shabbat food will be prepared within the confines of Jewish law. For travelers however, a tremendous amount of planning and preparation needs to take place before embarking on a trip that will include Shabbat. Food cannot be purchased on Shabbat because it is forbidden to use money, nor may any cooking be done. So travelers must either prepare or purchase their food beforehand, or find another solution. For visitors to Tzfat, this is where the Eshel Restaurant becomes helpful. Known for decades as an easy solution for religious travelers' Shabbat meals in Tzfat, the Teitelbaum family, Eshel's owners, have made the Eshel Restaurant into a wonderful homey stop for people who want delicious hot Shabbat meals whose preparation has adhered to all the laws of Shabbat. Since religious Jews don't use money on Shabbat, guests pre-order and pre-pay for their meals, and then arrive at the restaurant with their vouchers at mealtime. The meals are cooked in the Ashkanazi tradition with meat, chicken and potatoes and many of the "K" dishes that are common in Eastern European cooking - kishkes, knadalach, kreplach, knishes, and so on. Shabbat lunch features the famous Jewish "cholent", a stew of meat, potatoes and beans which is prepared and partially-cooked on Friday, and then set on a warming plate to slowly cook until Saturday's lunch. 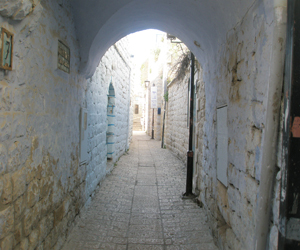 The Eshel restaurant is located on Bar Yochai Street in the Old Jewish Quarter of Tzfat, near the synagogues. They are not open throughout the year - they are open during the Jewish festivals, during Lag B'Omer and during the traditional summer vacation. The atmosphere at the restaurant is warm and friendly, with the staff often sitting together with the patrons to eat and share stories. The Teitelbaum family's richly-deserved reputation is one of "hachnasat orchim", making guests feel very much at home during their Shabbat sojourns in Tzfat.